For other uses, see Hora (disambiguation). In Greek mythology the Horae (/ˈhɔːriː/) or Horai (/ˈhɔːraɪ/) or Hours (Greek: Ὧραι, Hōrai, pronounced [hɔ̂ːraj], "Seasons") were the goddesses of the seasons and the natural portions of time. The word "Horae" comes from the Proto-Indo-European stem *Hioh1-r- "year." They were originally the personifications of nature in its different seasonal aspects, but in later times they were regarded as goddesses of order in general and natural justice. "They bring and bestow ripeness, they come and go in accordance with the firm law of the periodicities of nature and of life", Karl Kerenyi observed: "Hora means 'the correct moment'." Traditionally, they guarded the gates of Olympus, promoted the fertility of the earth, and rallied the stars and constellations. The course of the seasons was also symbolically described as the dance of the Horae, and they were accordingly given the attributes of spring flowers, fragrance and graceful freshness. For example, in Hesiod's Works and Days, the fair-haired Horai, together with the Charites and Peitho crown Pandora—she of "all gifts"—with garlands of flowers. Similarly Aphrodite, emerging from the sea and coming ashore at Cyprus, is dressed and adorned by the Horai, and, according to a surviving fragment of the epic Cypria, Aphrodite wore clothing made for her by the Charites and Horai, dyed with spring flowers, such as the Horai themselves wear. The number of Horae varied according to different sources, but was most commonly three: either the trio of Thallo, Auxo and Carpo (goddesses of the order of nature) or Eunomia (goddess of good order and lawful conduct) and her sisters Dike (goddess of Justice) and Eirene (goddess of Peace). In Argos, two Horae, rather than three, were recognised presumably winter and summer: Auxesia (possibly another name for Auxo) and Damia (possibly another name for Carpo). In late euhemerist interpretations, they were seen as Cretan maidens who were worshipped as goddesses after they had been wrongfully stoned to death. The earliest written mention of Horai is in the Iliad where they appear as keepers of Zeus's cloud gates. "Hardly any traces of that function are found in the subsequent tradition," Karl Galinsky remarked in passing. They were daughters of Zeus and Themis, half-sisters to the Moirai. 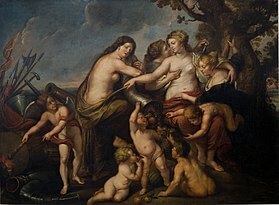 in the other variant, emphasizing the "right order" aspect of the Horai, Hesiod says that Zeus wedded "bright Themis" who bore Diké, Eunomia, and Eirene, who were law-and-order goddesses that maintained the stability of society; they were worshipped primarily in the cities of Athens, Argos and Olympia. Thallo (Θαλλώ, literally "The one who brings blossoms"; or Flora for Romans) or Thalatte was the goddess of spring, buds and blooms, a protector of youth. Auxo (Αὐξώ. "Increaser" as in plant growth) or Auxesia was worshipped (alongside Hegemone) in Athens as one of their two Charites, Auxo was the Charis of spring and Hegemone was the Charis of autumn. One of the Horae, and the goddess and personification of the season of summer; she is the protector of vegetation and plants, and growth and fertility. Carpo (Καρπώ), Carpho or Xarpo (not to be mistaken with Karpos) was the one who brings food (though Robert Graves in The Greek Myths (1955) translates this name as "withering") and was in charge of autumn, ripening, and harvesting, as well as guarding the way to Mount Olympus and letting back the clouds surrounding the mountain if one of the gods left. She was an attendant to Persephone, Aphrodite and Hera, and was also associated with Dionysus, Apollo and Pan. At Athens, two Horae: Thallo (the Hora of spring) and Carpo (the Hora of autumn), also appear in rites of Attica noted by Pausanias in the 2nd century AD. Thallo, Auxo and Carpo are often accompanied by Chione, a daughter of Boreas (the god/ personification of the North Wind) and Orithyia/ Oreithyia (originally a mortal princess, who was later deified as a goddess of cold mountain winds), and the goddess/personification of snow and winter. 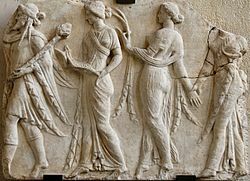 Along with Chione, Thallo, Auxo and Carpo were a part of the entourage of the goddess of the turn of the seasons, Persephone. Diké (Δίκη, "Justice"; Iustitia for Romans) was the goddess of moral justice: she ruled over human justice, as her mother Themis ruled over divine justice. The anthropomorphisation of Diké as an ever-young woman dwelling in the cities of men was so ancient and strong that in the 3rd century BCE Aratus in Phaenomena 96 asserted that she was born a mortal and that, though Zeus placed her on earth to keep mankind just, he quickly learned this was impossible and placed her next to him on Olympus, as the Greek astronomical/astrological constellation The Maiden. Eunomia (Εὐνομία, "Order", governance according to good laws) was the goddess of law and legislation. The same or a different goddess may have been a daughter of Hermes and Aphrodite. Eirene or Irene (Εἰρήνη. "Peace"; the Roman equivalent was Pax), was the personification of peace and wealth, and was depicted in art as a beautiful young woman carrying a cornucopia, scepter and a torch or rhyton. Eiar Spring Crowned with flowers, holding either a kid or a sheep, and having near to her a budding shrub: she is also characterised by Mercury, and by a ram. Theros Summer Crowned with ears of corn, holding a bundle of them in one hand and a sickle in the other: she is also characterised by Apollo, and by a serpent. Phthinoporon Autumn Either holds bunches of grapes, or has a basket of fruits upon her head: she is also characterised by Bacchus, and by a lizard or hare. Cheimon Winter Well clothed, and the head covered, stands near a tree deprived of foliage, with dried and withered fruits in one hand and water-fowls in the other: she is also characterised by Hercules, and by a salamander. "Here Spring appears with flowery chaplets bound. Here Autumn the rich trodden grapes besmear. Poussin has represented the four seasons by subjects drawn from Scripture: Spring is pourtrayed by Adam and Eve in paradise: Summer, by Ruth gleaning: Autumn, by Joshua and Caleb bearing grapes from the promised land; and Winter, by the deluge. In more modern representations the seasons are often surrounding Apollo: Spring, as Flora, crowned with flowers, and in a shaded green drapery over a white robe: Summer, standing under the lion in the zodiac, with a gold-coloured drapery over a white gauze vestment, the edges of which are tinged by the yellow rays of the sun, holding a sickle, having near her a wheat-sheaf : Autumn, as a Bacchante, in a violet-coloured garment, pressing grapes with one band into a golden cup, which she holds in the other; and Winter as an aged person, placed in the shade at a great distance from the god. Hours of Morning The ancients supposed each of the hours to be governed by a separate planet . rising of the sun; her wings are like those of a butterfly, and she holds the Sun and a bunch of full-blown roses. which the sun exhales from the earth; her attributes are the planet Venus and a sunflower. personification was therefore clothed entirely in white, and bore a hyacinth and the figure of the Moon. lotus, which, like the sunflower, follows the course of the sun. Hours of Night These, like the hours of the day, are depicted with wings, and in the attitude of flying; they differ from each other only in the colour of their drapery, and in their various attributes. ^ R. S. P. Beekes, Etymological Dictionary of Greek, Brill, 2009, p. 1681. ^ Galinsky, Karl (July 1992). "Venus, Polysemy, and the Ara Pacis Augustae". American Journal of Archaeology. 96.3: 459. ^ Hanfmann, G.M.A. (1951). The Seasons Sarcophagus at Dumbarton Oaks. Cambridge, Massachusetts. ^ Machaira, V. (1990). Lexicon Iconographicum Mythologiae Classicae, vol. 5.1. pp. 502f. ISBN 3-7608-8751-1. ^ Murray, John (1833). A Classical Manual, being a Mythological, Historical and Geographical Commentary on Pope's Homer, and Dryden's Aeneid of Virgil with a Copious Index. Albemarle Street, London. p. 256. ^ Murray, John (1833). A Classical Manual, being a Mythological, Historical and Geographical Commentary on Pope's Homer, and Dryden's Aeneid of Virgil with a Copious Index. Albemarle Street, London. pp. 172–174. Smith, William, Dictionary of Greek and Roman Biography and Mythology, London (1873). "Horae"
Look up Thallo, Auxo, or Carpo in Wiktionary, the free dictionary.